We are working on an old quilt now. A woman’s grandmother started it years ago, put together all these small pieces of cloth. I tried to count them once – or at least figure out how many different fabrics were used. But I lost track because there are so many fabrics and they each needed to be examined and appreciated so I forgot which number I was on long before I had completed the first circle. And then, of course, I needed to get back to my sewing. I don’t think anyone could really sort out which colors or designs go best next to each other in a quilt like this. I suppose the woman just had a basket of small pieces and she would pick one up, sew it to another, pick another one up and sew it and on and on and on. This quilt was pieced by hand. All those individual pieces sewn together! Now when we are quilting it, I marvel at her patience and tenacity. I look at the numerous pieces of fabrics – the calicoes and pinstripes and florals and ones with tiny dots. All different and I suppose if we picked two at random, discussed whether they complemented each other, we might decide those two fabrics really didn’t go together well at all. But when I look at the whole quilt, it has such a pleasing effect. The various patterns and colors pull your eyes like any pleasant scene. Can I stretch this experience to people? Are there times when two people might rub each other the wrong way and yet in the context of a larger group, they actually turn out to complement each other? This is what the town is like to me; different people here together in a seemingly random selection. No one can really say how we came together or if that one really suits his or her neighbor but the overall effect certainly garners respect. There are moments when I am both perplexed and amazed by the intersection of the old and the new. One example is writing this blog about hand quilting; using a computer, digital images and the web to tell about a group of women sewing by hand in a small town in northwest Montana. I recently read a book where the author looked at the impact of technology on our lives. He mentioned the anonymity that the Internet often offers us and saw this as a negative aspect. I realized that I was fairly anonymous in writing this blog so decided to try to rectify that. 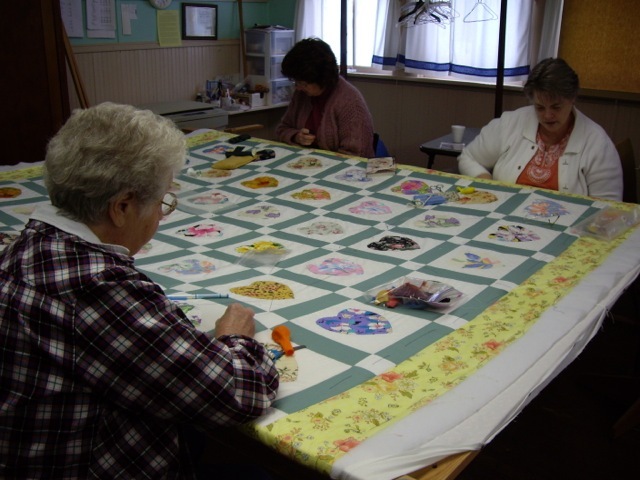 I found a photo that Cathy had taken of me quilting last spring. I doubt if the photo will tell you much about me but I realized that it told other things. We quilt on Fridays in the old School House. We are surrounded by chalkboards, desks, maps and books. In many ways this suits me as I am a teacher – at least that is how I made my living for many years. Quilting in a classroom feels natural to me; the exchange of information, teaching skills, the patterns and the discussions about life are all there. Student, teacher, quilter – I imagine many of the women I quilt with could see themselves in these roles. Yet even as we sew by hand in the old classroom, we still embrace the new. We have a presence on the web, we take digital photos of the quilts we finish and some of us discuss things via email. Perhaps it is an extension of our quilting where sometimes we quilt with new fabrics and other times the fabrics are quite old. Muslin, tiny floral prints, batiks…we manage to sew them all. As a new quilter and one who finds the stories told more interesting than the stitching, I am continually amazed by the women who quilt all day Friday and then go home to quilt some more. 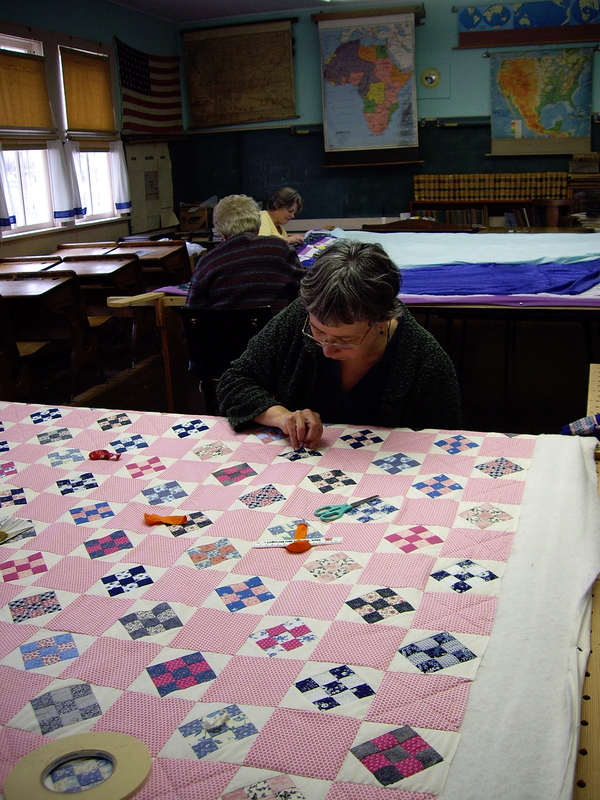 Cathryn makes countless baby quilts that are sold at the Historic Village museum. Joan is always working on quilts at home (although how she does it in a small house with all her cats is a mystery to me). Every week Gayle or Judy or one of the other women brings in a quilt finished at home to show the others. I look at the tiny stitches and marvel at their patience and skill. Recently Lynda brought in a quilt that she designed and made for her grandchild. Lovely colors and such a fanciful design! I imagine the small person who received it will treasure it for years. This particular grandchild lives in Alaska so I like to think the tropical colors will help make the quilt especially warm in the winter. The women who quilt have so many stories. 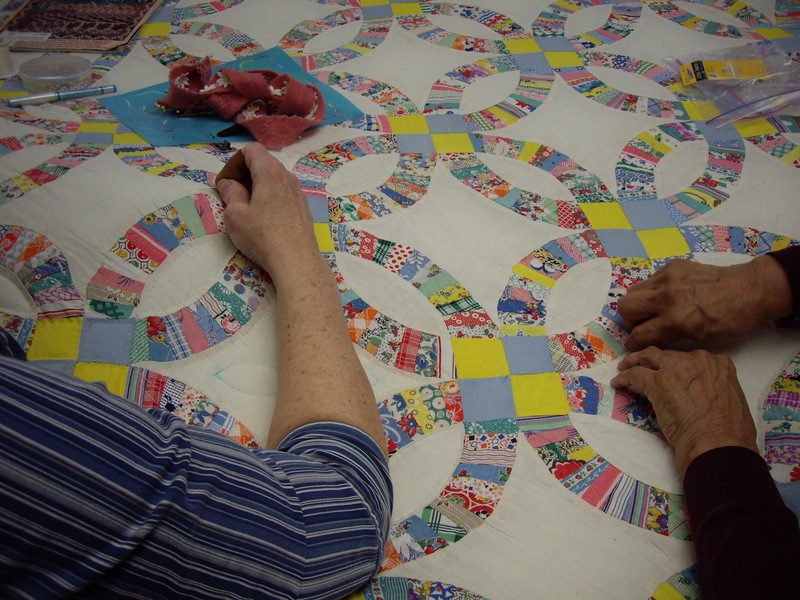 Often when they quilt, there is the quiet buzz of conversation. It seems that these stories become part of the quilt the women are working on. Each stitch joins not only the layers of fabric but also joins the lives of the women to the finished quilt. 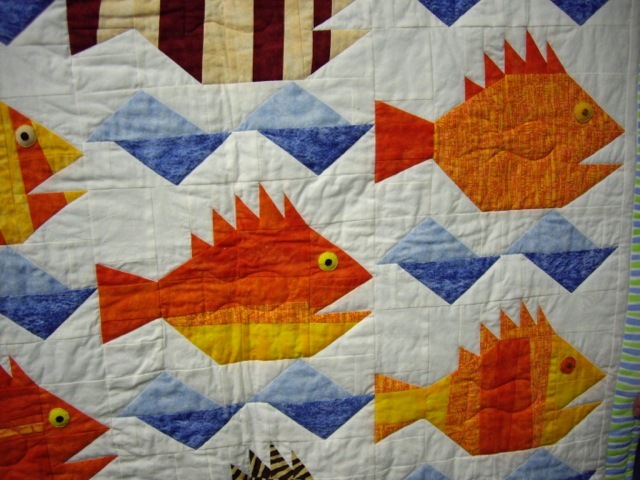 Some of the women have been quilting for decades. A few recently joined the Friday group. As a novice quilter, I am amazed how the others can talk and at the same time make such small neat stitches. The quilts that the group works on come from different places. Some are old quilts that were never finished, started years ago and then for various reasons put away or left incomplete. A family member brings the quilt to the women at the Historic Village to finish. Other quilts are new; perhaps made by someone who wanted their work quilted by hand and decided to ask the Village quilters rather than put in the countless hours required to quilt it alone. And some quilts are pieced together by one of our members and then quilted. Those quilts made by the women in our group are raffled off to raise money for the Historic Village or given to organizations or individuals in need. Wherever a quilt ends up, hanging on a wall or covering a bed, or perhaps even in some trunk, I imagine that the stories are still alive, still buzzing softly.